Why are we making iSpy Quilts? Because an I See quilt can provide educational experiences for young children, and we would like to have more children benefit from having one. Collectively, we have the resources and skills to do this, and outreach is part of our mission. You can see more iSpy Patterns HERE. At the July 28th & August 4th organizational gatherings, members present decided that we would make three (hopefully more) iSpy quilts that we would donate to organizations such as the Red Stocking Fund and the Children's Center at MV Community Services. Below are photos of iSpy patterns that we will use for the first three quilts. This pattern is from the Missouri Quilt Company. Katherine is making two iSpy quilts using this pattern for two baby twin girls. You may download the free pattern and access the video by clicking HERE. 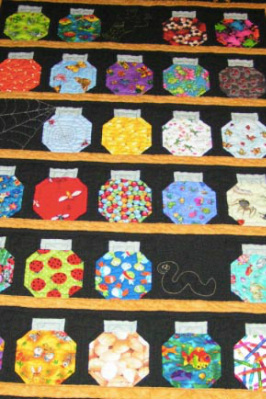 Below is an example of this type of quilt. It was posted on the 'Quilting Board's Message Board" by TerryQuilter. Click HERE to see more about Terry and this quilt. MaryAnn Palermo & Linda created this easy iSpy pattern. 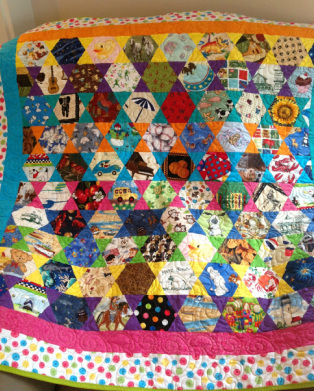 Over the past 15 years, they have each made this quilt for at least ten babies. Linda & MaryAnn are in the process of developing instructions that will be posted here. Click on photo below to see more pictures. Kathleen's quilt is from a pattern designed by Pat Yamin and purchased from Come Quilt with Me. Click HERE to see and/or purchase the pattern.